Gnomon Training - Fundamentals of Perspective 3 Volumes (DVDRip) | Free eBooks Download - EBOOKEE! Posted on 2013-03-27, by vis87. Learn the tools and techniques of Perspective from an illustration legend. Gary Meyer has taught perspective to some of the top concept designers and illustrators working in the entertainment industry today. Gary Meyer has served as an instructor at Art Center College of Design for 23 years. He has served as Professor and Master of the College and was the recipient of the first Faculty Award (elected by the faculty of Art Center). Gary has also been awarded seventeen Great Teacher Awards (elected by the graduating classes). His teaching experience includes Advanced Illustration, Advanced Sketching, Advanced Sketching for Illustration, Perspective, Intro to Head Painting, Head Drawing, Entertainment Design, Visual Communication 3, Visual Communication 5, Communication Sketching, Portraiture, Architectural Design 1 and 2, Matte Painting, Composition and Painting. Gary has also taught at Otis College of Art and Design, Universal Studios Design and Development and the Animation Institute of Los Angeles. His commercial clients include all major aircraft companies, all major motion picture studios, Reader's Digest, Random House, Six Flags Parks, Levis, CBS Records, Electra Asylum Records, New West Magazine, Warner Books and many others. A solid understanding of Perspective gives the artist the means to draw what they see both accurately and believably. This series on the Fundamentals of Perspective will provide artists with the understanding of not only the concepts but also put them into practice as Illustration master Gary Meyer guides you through each exercise. In this lecture titled Fundamentals of Perspective 1: One-Point Principles and Concepts, the basic concepts of one-point perspective will be covered. This lecture primarily focuses on the fundamental understanding of the principles, terminology, and the concept of scale in perspective. Gary will demonstrate through various exercises, how to not only set up an illustration in perspective, but also how to draw objects to scale using methods to transfer scale from one object to another in correct perspective. The principles and concepts discussed here provide a solid foundation that the following lectures build upon. A solid understanding of Perspective gives the artist the means to draw what they see both accurately and believably. 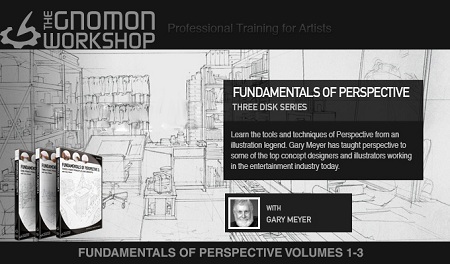 This series on the Fundamentals of Perspective will provide artists with the understanding of not only the concepts but also put them into practice as Illustration master Gary Meyer takes you through each exercise. In this lecture titled Fundamentals of Perspective 2: Two-Point Principles and Concepts, we continue the discussion with an overview of Two-Point Perspective. Gary discusses methods of measuring and plotting scale correctly in two-point perspective by first discussing ways to transfer scale correctly, then using those techniques, he demonstrates how to correctly draw from plans and elevation diagrams. Gary then demonstrates how to plot various surfaces like ellipses and incline surfaces in perspective. Lastly, he discusses concepts dealing with auxiliary vanishing points, the cone of vision and using both one and two point perspective correctly in a drawing. A solid understanding of Perspective gives the artist the means to draw what they see both accurately and believably. This series on the Fundamentals of Perspective will provide artists with the understanding of not only the concepts but also puts them into practice as Illustration master Gary Meyer guides you through each exercise. In this lecture titled Fundamentals of Perspective 3: Three-Point Principles and Concepts, we begin by discussing three-point perspective. Here, Gary breaks down three-point perspective and illustrates the terminology and concepts to consider when using three-point perspective. We then move on to a variety of topics, starting with methods for plotting shadows in perspective using both natural and artificial light scenarios. The series ends with Gary discussing how to correctly plot reflections in both one and two-point perspective and ends by demonstrating how to plot and transfer scale in reflections. No comments for "Gnomon Training - Fundamentals of Perspective 3 Volumes (DVDRip)".